Figure A66. New Hebrides anomaly, interpreted as the New Hebrides slab, with (horizontal) [vertical] cross sections through (A)[D] the UUP07 p-wave) and (B)[D] the combined SL2013 and S40RTS s-wave models at 410 km; C) the location of the modern geological record that we interpret to have formed during the subduction of the slab. 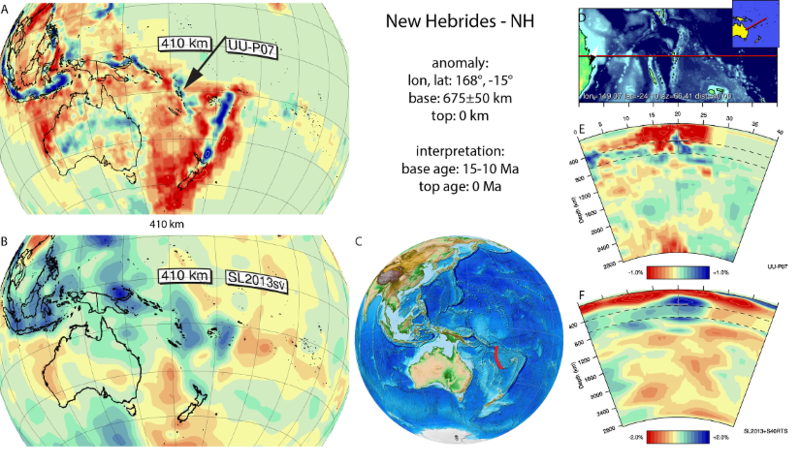 The New Hebrides anomaly (Figure A66) is located west of the northern termination of the Tonga trench, and is interpreted as lithosphere still subducting at the New Hebrides subduction zone. It is a NW-SE trending slab that was imaged before by Fukao et al. (2001), Hall and Spakman (2002; 2004), Schellart and Spakman (2012), Fukao and Obayashi (2013) and Obayashi et al. (2013). It reaches the base of the upper mantle. The NE-dipping New Hebrides subduction zone is interpreted to result from subduction polarity reversal due to the arrival of the Ontong-Java plateau into an originally contiguous Solomon-Vitiaz-Tonga-Kermadec subduction zone, around 15-10 Ma (Hall, 2002; Sdrolias et al., 2004; Schellart et al., 2006; Seton et al., 2012), which we adopt for the age of the base of the slab.